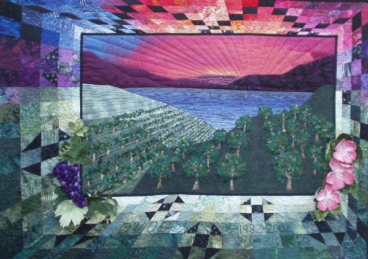 The Orchard Valley Quilters Guild, a registered non-profit society established in 1982, offers a place and time for the exchange of creative ideas, the fostering of friendships and the camaraderie found in the practice of many forms of quilting. Guild members strive to improve their knowledge and share it with one another and the next generation of quilters, and to give back to their community by providing quilts to offer comfort to those in need. We are an active group of more than 100 members. Check out our Activities page to learn about our many programs and projects; the Donations page will give you an idea of our community involvement. Our community involvement also extends to making quilts celebrating special events such as the Kelowna Centennial in 2005 and our participation in a quilt exhibit at the Okanagan Heritage Museum in 2018. In addition, the guild maintains a library with hundreds of books, magazines, videos, specialty rulers and other items. We sponsor a biennial quilt show, guild trips (in the past we have been to Sisters, Seattle, Tacoma and Spokane), workshops (Joen Wolfram, elinor peace bailey, Lura Schwarz Smith, Marianne Parsons and Kathy Kinsella to name a few) and, from time to time, a retreat. Faith Butticci, one of our guild's founding members, wrote, "I remember seeing an ad in the college calendar for a quilting class being offered. I signed up and on that first night met another student who was ready to work. She had come with magazines and wall paper samples. She had just redecorated her bedroom and wanted to make a quilt. She was really impressive with her I-can-learn-this attitude. We were, however, due to be disappointed. The quilting class consisted of the instructor providing a quilt top which we were expected to hand quilt. That was the first and only class as the college canceled the rest of it due to the high number of withdrawals." In the fall of 1982, Wanda Lebedkin, Charm Gerace, Delora Kuyvenhoven, Beryl Cooke and Faith Butticci met for the first time. Charm, Delora and Beryl had attended a quilt class given by Wanda and Faith had been in another of Wanda's classes. Faith had the information from Quilts Canada regarding the formation of a guild. The five women made posters and put them up around Kelowna and arranged to have their first meeting in the old Kadac Building at the corner of Richter and Bernard. Forty people turned out for that first meeting and twenty-five of them signed up as members. The guild's logo, a Churn Dash block, arose from a contest held among the original members. All the blocks that were submitted to the contest were sewn into the original guild banner. In 1983, the guild moved its meetings to the Kelowna Yacht Club. The Kelowna Curling Club became home to the guild for the next 12 years (1984-1997). In the fall of 1997 the guild moved to its present location at the Okanagan Mission Hall. In 1984, two years after its creation the guild hosted its first quilt show and has hosted a biennial quilt show ever since. Over the years membership has grown to more than 100 members. Major events marked our 20th, 25th and 30th anniversaries. On June 2, 1993, the guild became a registered, non-profit society. Our guild banner, Sunsational Orchard Valley, was designed by Susan Martin and Laurie Turik to celebrate our guild's 20th anniversary. Created during the summer of 2002, the design was inspired by the beauty of our Okanagan surroundings and the book Pieceful Scenes by Angela Madden. painting and machine quilting, Val Flannigan, Lucille Poitras and Donna Schneider joined their talents with those of Susan and Laurie to turn the design into a beautiful piece of fabric art.